Gray cats are actually silver or blue. Gray coats abound in the world of purebred cats and regular old house kitties. Certain shorthair breeds come in gray, and a few are exclusively gray, so it may surprise you to learn that, according to the cat show world, there's no such color. Sure, they look gray, but among cat fanciers and cat show circles, they're either blue, which looks a lot like dark gray, or silver, which looks suspiciously similar to light gray. They can even be silver-blue, but nowhere in the cat show and purebred cat world will you find a cat who's actually called gray. The British shorthair is the quintessential British cat. Think Cheshire cat when you think about these guys -- big, round cheeks, smily face and thick, short "teddy bear" fur. Blue is the classic British shorthair color, but they're also available in almost every other color and pattern. Their ancestors are English alley cats. The delicate and acrobatic Egyptian mau cat comes in a choice of three colors underneath a contrasting dark, spotted pattern: silver, smoke and bronze. Silver and smoke maus look extremely gray underneath their spots. 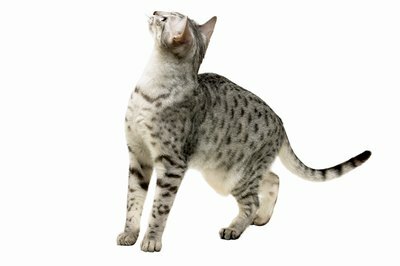 They have thick, short coats and are the only purely domestic cat breed with spots. They do, indeed, trace their ancestry back to Egypt. Three short hair and one medium hair cat breeds are exclusively gray -- that is to say blue, silver, or silver-blue. Chartreux, a French breed, is available only in blue. Their origin is shrouded in legend and the mists of time, but their ancestors were probably mousers in 17th century monasteries. Russian blues share a great deal of ancestry with Persians and British shorthairs. The main difference between the Russians and the Brits is face shape -- Russians' faces are more slender and pointed. The International Cat Association: What Color Is My Cat? Do Cats Get Gray Hair? How Do Cats Know They're Cared For? Do Cats Get Really Clean by Licking Themselves? How Does a Cats Liver Get Inflamed?